Begun in 1842, Archway House was originally intended to be the first of 20 identical structures (or lodges) to be constructed on the Duke of Portland’s estate at Welbeck Abbey in Nottinghamshire. Only one was built. A rehearsal for the Houses of Parliament? In 1835 fire destroyed the old Houses of Parliament, and the 4th Duke of Portland offered limestone from his quarries at Mansfield Woodhouse in Nottinghamshire to build the replacement. 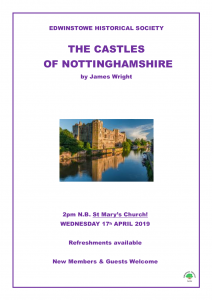 Some doubt was expressed over the stone’s suitability for the whole construction; the Duke disagreed and vowed to prove the durability of Nottinghamshire stone through the construction of a series of new lodges or gatehouses on his extensive Welbeck estate. The first – today’s Archway House – was sited on the ancient Broad Drive (renamed the Green Drive by the Duke), positioned so as the view through the central arch would focus on the ‘Centre Tree’ in Sherwood Forest, 1 1/2 miles away. The first stone of Archway House was laid in June 1842 with the building work being completed some two years later at a cost of £16,000. It was built by Hurst & Moffatt for the 4th Duke of Portland. In accordance with the Duke’s intention to emphasise the qualities of Mansfield Stone, the surfaces of Archway House are highly dressed, with, (as one early commentator put it), “the countless magnesian particles glittering in the sun as if sprinkled with diamond dust”. 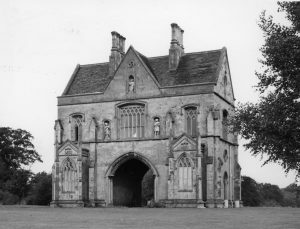 In design Archway House is based on the medieval gatehouse at Worksop Priory. The niches contain statues connected with the forest folklore of Sherwood – Robin Hood, Little John and Maid Marian on the south side; and King Richard, Friar Tuck and Allan a-Dale on the north side. 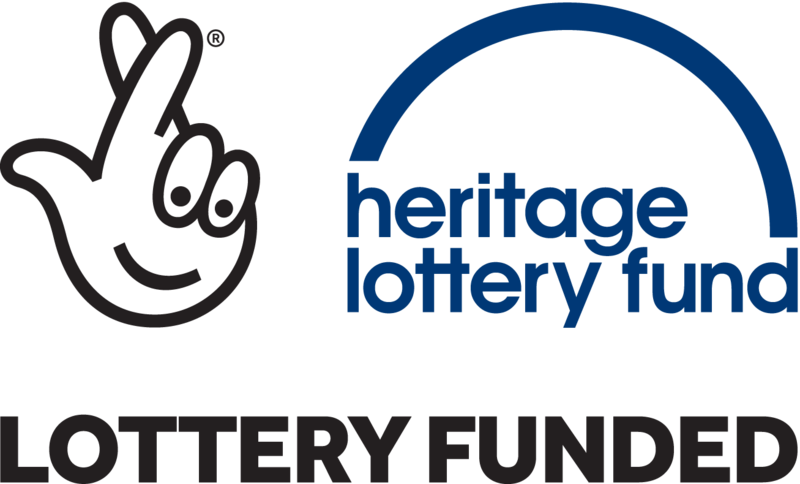 Four hares – emblems of the Portland family – decorate the north and south side parapets. With the death of the 4th Duke of Portland in 1854 none of the further 19 projected identical lodges were built, and the rooms at Archway house took on various uses. 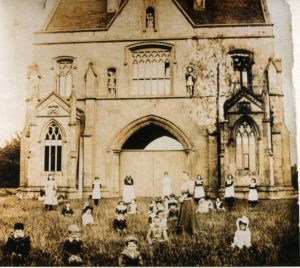 Those on either side of the main arch were used as dwellings for estate workers, whilst the principal room above the arch served as a schoolroom for 30 children from the Portland’s Welbeck, Edwinstowe and Clipstone estates. 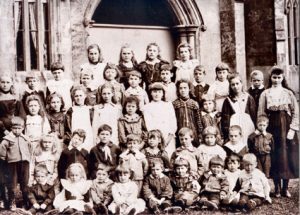 The school catered for girls from 5 – 15, and boys aged 5 – 7, each pupil supplied with red-cloaked uniforms provided by the Portland estate. A new school at Clipstone was provided by the Duke of Portland in February 1906 and the pupils transferred there. In the 1980s Archway House was a private home, being converted in 2010 to self-catering holiday accommodation for visitors to Sherwood Forest. I have just found an old sampler embroidered by my great-grandmother, Maria Day, about 1868 and at the bottoms she has embroidered “Clipstone Archway School”. 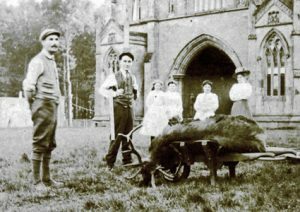 I know that she was from Edwinstowe and that her father, James Day, was a schoolmaster and Methodist Minister who died young leaving two children, Maria and Harry. His wife Eleanor (nee Butler) made a living by dressmaking and hat trimming. She moved to Matlock when she was sixteen and married George Hodgkinson. 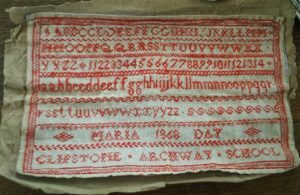 Is it possible that Maria was one of the children who produced this beautiful sampler?